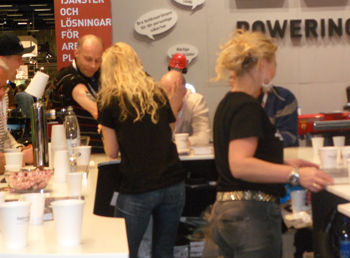 The Nordbygg exhibition, held last week in Stockholm Sweden, was a success. It was the yearly construction exhibition and it was very crowded with visitors. We sold products on spot and made some good connections. Our theme was rock with the bikers “Choppers” cool attitude. 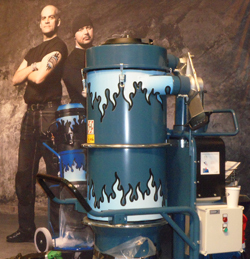 Our dust extractors were "pimped" with flames, see picture. We also had a band called Heavybaron playing on the stand during Thursday. See clip further down. However, they had a little trouble to drown out the fair's visitors and machinery, but they did rock. To increase your coolness even more, you could get a Dustcontrol designed tattoo rubbed on your arm or neck. Thanks to all of you that visited our stand and we hope to see you again next year!